A Port Charlotte man holding signs asking speeding drivers to slow down near his son's school seems to be making an impact. Chris Analetto said he used to see dozens of drivers speeding every day in front of Peace River Elementary on Beaver Lane, but has seen a drastic reduction in the past week. 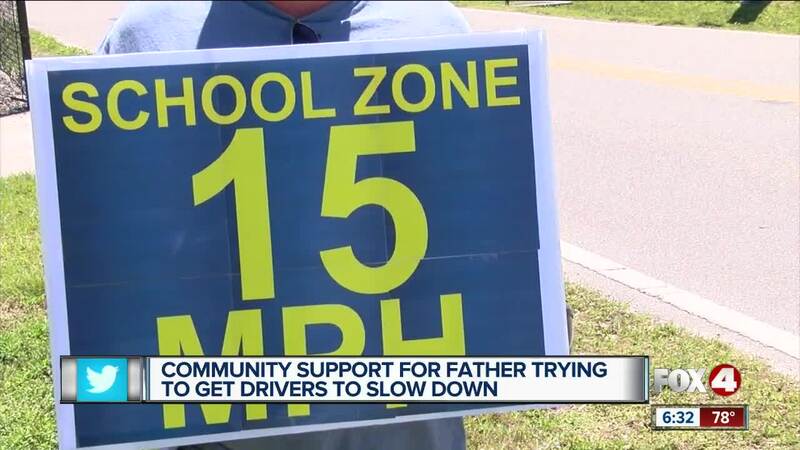 PORT CHARLOTTE, Fla. — A Port Charlotte man who has been holding a sign to remind speeding drivers to slow down near his son's school seems to be making an impact. Chris Analetto said he used to see dozens of drivers speeding every day in front of Peace River Elementary on Beaver Lane, but has seen a drastic reduction in the past week. "The sign is helping," Analetto said. "At first I'd see fifty, sixty speeders a day out here. Now, maybe one or two." He holds his sign reading "School Zone - 15 MPH" along the road outside the school during the period in the afternoon when school lets out. There are also signs posted by the county with flashing yellow lights during that period on the nearby corner of Beaver Lane and Hancock Avenue. Monday, a few other parents and friends of Analetto stood with him. "If you can just educate (drivers) about what's going on, they'll do the right thing for the most part," said Jack Wilszewski, a friend of Analetto's. Despite the support, a Fox 4 camera caught one driver who apparently drove too fast past the school. A patrol deputy pulled the vehicle over, but the driver seemed to not notice the patrol car's flashing lights until it was well past the school. "That just proves my point," Analetto said. "That officer tried to pull them over way down the street." Wilszewski thinks a crossing guard posted at Beaver Lane and Hancock Avenue would make drivers mind their speed. "If they see a crossing guard, then they're aware something's going on here," he said.